Lebanon is the civilizations crossroads, especially in it’s historical citadel in Batroun. Our goal is to bring back the lebanese expats to their homeland…Where they have a special place to live in and experience interaction with other expats from different countries. Mr. Norman Nahas, President of The Canadian-Lebanese Chamber Of Commerce & Industry-Halifax Section, is leading this project with the support of the Lebanese Consulate Office, Dr Nick Kahwaji ( President of the WLCU -BC council) joined the committee upon invitation from H.E. Wadih Fares the Honorary consulate in Halifax. Minister Bassil and Russian ambassador Alexander Zasypkin inaugurated the Lebanese Russian house in the Diaspora village in Batroun during the last day of the LDE conference 2016. 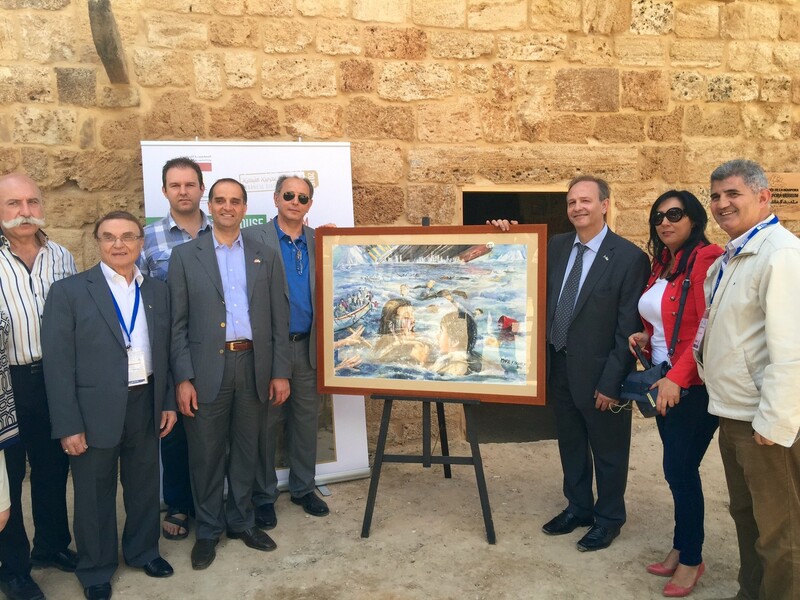 A painting of the Lebanese emigrant by Artist Bernard Renno was donated to the ministry of foreign affairs to be displayed at the Russian house or the ministry building. on the left: a photo from the balcony toward the entrance of the Lebanese Canadian house. representatives from Nova Scotia, Alberta and BC, welcomed minister Bassil at the future Lebanese Canadian house. Mr Norman Nahas showed him the restoration work in progress (the floor already finished) and discussion followed on the best way to portray the Canadian Multicultural heritage. From left to right: Norman Nahas, Minister Bassil, Bassam Nahas, H.E. Sami Haddad. The Canadian delegation also visited the site of the future emigrant museum where the Titanic painting by Artiste Marie Khoury (chosen by the minister from the titanic exhibition) will be displayed. Previous article Colette Haddad a Lebanese painter, entered the Guinness World Record for the largest underwater painting.